with a new advanced technology! They do not need to be close to the body as the energy will extend about three feet. The Energy Tag does not need to be used 24/7, use as needed. For those who use a cell phone, or computer the metal Energy Tags or Medallions are a better choice, as they cannot be corrupted and hold the same remedies as the Cards. The Energy Tag does not get depleted with use, and will hold the programmed energy forever. Your whole family can benefit from one Tag! House Dust * Fungus *Metal * Foods including Wheat * Rye * Gluten * Lactose * Homeopathic Food Allergy Remedy * Contact Dermatitis * Dermatitis Atopic * Asthma (Allergic Reaction) * Synthetic Material *Atopic syndrome *Anaphylaxis * Acquired hypersensitivity. The Metal Energy Tags can hold many more specific frequencies than the Patches and cannot be corrupted, and will hold the energy forever. The energy it contains may be shared with others. The body will only take in what it needs so anyone close to the Tag may benefit if their body resonates with, and needs the frequency it contains, if not their body will ignore it! The Energy Tags may be attached to inner or outer clothing worn around the neck or placed in a pocket; they may be attached to belt loops. They can be placed on a nearby desk or side table.For food allergies they can also be placed under the food or drink. This Tag is programmed with important Anti-Aging Energy Frequencies. This Tag contains the specific energetics that help a person feel alive and more energetic. People seem to become more physically active, they look and feel younger. This program contains the Universal Healing Frequencies and Universal Sub-Harmonic frequencies. ATP is responsible for supplying this energy to our cells. Cells are the building blocks of life. They come in many different shapes and sizes. Each cell has a specific function to help the organism to perform tasks necessary for survival. For instance, nerve cells are needed to communicate messages to our brains. They also allow us to think. Another example is the cells that make up our various muscles. All cells perform specific tasks, and all cells need energy to perform these tasks. 26 ATP Chromosomes * ATP Basic Energetics * Structured Water frequencies *Ubiquinol (an antioxidant to support the body’s energy production). The Digestive Gluten Celiac Tag is Designed to Aid in the Digestive Process. The digestive system is the largest system in the body and involves many organs, and the process of digestion has many stages. Each part of the digestive system is subject to a wide range of disorders. With this metal Energy Tag we have tried to add frequencies that will aid in the digestion of food, including the energetics of bacteria that are friendly to the system. This Energy Tag contains all the frequencies in the Patch plus many more. These Tags are complementary to the patches so both can be used at the same time, but do not mix more than three different types of THERAPY at the same time. It is better to prioritize. It is preferable to use one Tag at a time depending on the therapy, but you can alternate different Tags throughout the day or at night. The Tags can hold many more specific frequencies than the Patches. The energy it contains may be shared with others as it extends about three feet. The body will only take in what it needs, so anyone close to the Tag may benefit if their body resonates with, and needs the frequency it contains, if not their body will ignore it! The Tags may be attached to inner or outer clothing worn around the neck or placed in a pocket; they may be attached to belt loops. They can be placed on a table can also be placed under the food or drink plate. Your whole family can benefit from one Tag! It can be placed under the food plate or under the dishes. When researched and tested this card was taped under a round wooden dining table and the energy was measurable three feet above the table! This means a whole family can benefit at one time! The energy can also transfer through glass but other materials were not tested. These Tags will be invaluable when you eat at restaurants, place under the food plate for a few seconds. Be careful not to leave it behind when you leave! Will Encourage Hair Growth by Stimulating the Hair Follicles, use continually to prevent a dying off of the new hair. There are many causes for hair loss, this new metal Energy Tag covers a broad range of causes, from alopecia to pathological. The most important purpose of this Tag is to stimulate the hair follicle. Hair grows very slowly so this Energy Tag may need to be worn for many months before seeing any improvement, and it may have to be worn forever to keep the follicle alive – but I have had very encouraging feedback from those testing it for me and luckily the Tag will hold the energy forever! Most people think that massaging the scalp is helpful, unfortunately running the fingers through the hair close to the scalp can break off the baby hair starting to grow. The better way to encourage hair growth is to place all your fingers on the scalp and move the scalp around in small circles to encourage blood flow. Many herbs and stimulants have been added to the Hair Stimulation Tag, but I believe the most important addition is ATP Plus. If you think your hair loss is connected to a chronic illness the ATP Energy Tag could be a useful addition to your overall health and will also strengthen the ATP in the Hair Stimulation Tag. You could use both together. The Hair Follicle Stimulation Tag will work best when used continually to prevent a dying off of the new hair. I believe it needs to be a forever product as the hair follicle could die off without permanent stimulation. There are many causes for hair loss, balding, alopecia, etc. this new Energy Tag covers a broad range of causes, from alopecia to hair mites. The most important purpose of this Tag is to stimulate the hair follicle, and it contains the follicle stem cell frequencies. Hair grows very slowly so this Tag may need to be worn for many months before seeing any improvement, but I have had very encouraging feedback from those testing it for me! The Patches and Tags are compatible so both can be used at the same time. You will see quicker results if you concentrate on no more than three different types of THERAPY at the same time; it is better to prioritize. I advise starting off using only one at a time, but you can alternate different Tags throughout the day or at night until you feel that your body can handle more. The Energy Tag may be attached to inner or outer clothing worn around the neck or placed in a pocket; they may be attached to belt loops. The Tag energy will radiate out about three feet so they can be placed on a nearby desk or side table and also be placed under a bed pillow. To maintain and support a healthy life. Health Support supports all other products and is a good basic patch to maintain health. 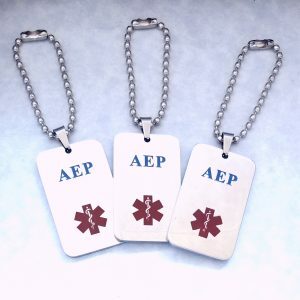 These Energy Tags have been programmed with a new advanced technology, and have expanded health benefits the rejuvenation frequencies boost any other AEP products being worn. This Energy Tag also provides important health support for those with chronic conditions. One of the biggest factors in aging is a buildup of MAO (monoamine oxidase enzyme) The GH-3 helps to normalize the levels of MAO. This enzyme tends to start building up in the body after age 45. Too much accumulation can lead to tiredness and depression. When the energetics of the GH-3 normalizes the levels of the MAO enzyme in the body we have a better youthful outlook on life. The Patches and Energy Tags work well together and both can be used at the same time, but we still do not advise mixing more than three different types of THERAPY at the same time. It is better to prioritize. These Energy Tags can be worn round the neck, or on a pant loop, they can be placed under a bed pillow at night. The energy will extend about three feet – so the Tag energy may be shared with others! The body will only take in what it needs so anyone close to the Tag may benefit, if their body resonates with and needs the frequency it contains – if not their body will ignore it! The metal Tag cannot be corrupted by other electronic products, and the programmed energy will last forever. Lyme Disease is caused by a number of different strains and species of Borrelia bacteria. The new Medical Energy Tags cannot be corrupted and will hold the energy forever. They have been designed and programmed with a new advanced technology. They can be worn around the neck or attached to a belt loop. The Lyme Regimen Metal Tag contains these strains.Many people are misdiagnosed as having Lyme Disease, but are actually infected by the Babesia microti, a microscopic malaria-like parasite (also called a piroplasm), that infects red blood cells. Borrelia Burgdorfer * Borrelia afzelii * Borrelia garinii * Babesia microti * Mycoplasma * Biofilm Bartonella bacilliformis * Borrelia Hermsii * Coxiella burnetii * DermacentorEncephalitis Flaviviridae * Erlichia * Rickettsia* Tick Fever. New reports state that up to 40% of patients with Lyme disease experienced concurrent Babesia Microti, which makes it very difficult for a Doctor to diagnose, as the symptoms are very similar to Lyme Disease, but the treatment is very different.Scientists believe Babesia microti is the most common piroplasm infecting humans. Babesia microti has been added to the Lyme Regimen products so that the body can utilize it if needed. Babesia Microti can increase the severity and duration of Lyme disease. Co-infected patients are more likely to have experienced fatigue, headache, sweats, chills, anorexia, emotional lability, nausea, conjunctivitis, and splenomegaly (enlargement of the spleen) more frequently than those with Lyme disease alone. Babesia patients can remain symptomatic for years with constitutional, musculoskeletal, or neurological symptoms. One-third of patients with a history of both Babesia microti and Lyme disease remained symptomatic an average of 8 years or more. We also have a Lyme Pet Tag, it can be very serious if a dog gets infected. It is not very common in cats.All content is for informational purpose only. This product combines Ancient Wisdom with the latest advances in Memory Therapy! You will see quicker improvement if you concentrate on no more than three different types of therapy at the same time; it is better to prioritize. For better results it may be preferable to use one Energy Tag at a time at first, but you can alternate different Energy Tags throughout the day or at night. Long term memories * Improve Short Term Memory * Confidence * Motivation * Ashvagandha * Bacopa Monieri * Ginko Biloba * Pennywort * Rosemary * Sage * Serotonin * Concentration * Mental Clarity* Mental Alertness * Brain Fog Relief * Focus * Calculation * Stimulate Area of Association.The Energy tags may be attached to inner or outer clothing, worn around the neck, placed in a pocket or attached to belt loops. They can be placed on a desk or side table or placed under a pillow at night.The Card energy may be shared with others, as the card does not lose its energy! The body will only take in what it needs so anyone close to the Card may benefit if their body resonates with, and needs the frequency it contains, if not their body will ignore it! This Energy Tag contains the energy frequencies to protect against most oral bacteria. These innovative metal Energy Tags have been designed and programmed with a new advanced technology! The Energy Tag does not get depleted with use, or corrupted by cell phones or other electronic equipment. The energy will extend about three feet and will last forever. The oral cavity appears as an open ecosystem, with a dynamic balance between the entrance of microorganisms, colonization modalities, and host defenses aimed to their removal. To avoid elimination, bacteria needs to adhere to either hard dental surfaces or epithelial surfaces. Oral bacteria evolved to form biofilms on hard tooth surfaces and on soft epithelial tissues, which often contain multiple bacterial species. In a crown or root canal the sealant can shrink after a few years, and become a safe habitat for bacteria where antibiotics cannot not reach. The Oral Bacteria & Biofilm Medallion should be worn 24/7 if you have any root canals, crowns or implants. Once the bacteria have been eliminated it should be worn, on a regular basis as a preventative. Patches can be worn with the Energy Tags both can be used at the same time, but still do not mix more than three different types of THERAPY at the same time. It is better to prioritize. It may be preferable to use one Energy Tag at a time at first depending on the therapy, but you can alternate different Energy tags throughout the day or use at night under your pillow.. The oral cavity appears as an open ecosystem, with a dynamic balance between the entrance of microorganisms, colonization modalities, and host defenses aimed to their removal. To avoid elimination, bacteria needs to adhere to either hard dental surfaces or epithelial surfaces. Oral bacteria evolved to form biofilms on hard tooth surfaces and on soft epithelial tissues, which often contain multiple bacterial species. In a crown or root canal the sealant can shrink after a few years, and become a safe habitat for bacteria where antibiotics cannot not reach. Research confirms that our mouths can become home to approximately 280 bacterial species in the oral cavity that have been isolated in culture and formally named – more bacteria than in any other area of the body! It is believed that there could be thousands and they can spread throughout the body and cause many diseases. Your mouth can also be a host to oral candidiasis. If you care about your health please read the website below – you will be shocked, and wonder why we have not been educated about this. I have already found that Staphylococcus Aureus can cause Rheumatoid Arthritis by invading joints; where anti-biotics cannot reach. The bacteria can also cause damage to hip and knee replacements.This Medallion starts by eliminating the bacteria, and providing relief very quickly. Dentists who understand about the dangers to our health from all of these bacteria are called Biologic Dentists and belong to IAOMT.org. The Energy Tags may be attached to inner or outer clothing, worn around the neck, or placed in a pocket; they may be attached to belt loops. They can also be placed on a nearby desk or side table, and placed under your bed pillow. All content is for informational and educational purposes only. Statements have not been evaluated by the FDA. Any product or content contained herein are not intended to diagnose, cure or prevent any disease. The Energy Tag can be worn around the neck or attached to pant loops. The chains are also programmed. The energy cannot be corrupted, and will last forever. We all have little headaches and aches and pains from time to time. The AEP Energy Tag is programmed to create a higher level of comfort at the time of pain. Sciatica * Neuralgia * Biofilm * Relaxation etc. Please be aware that Pain is a warning from the body, if you do not know the cause of the pain be sure to seek medical advice. Do not immediately start doing things that the pain stopped you from doing. For instance – if an arm or leg has been damaged start by using it slowly for short periods of time – give the body time to gradually get used to being used again! Whether it is a car accident or surgical procedures, both are an emotional and physical trauma. 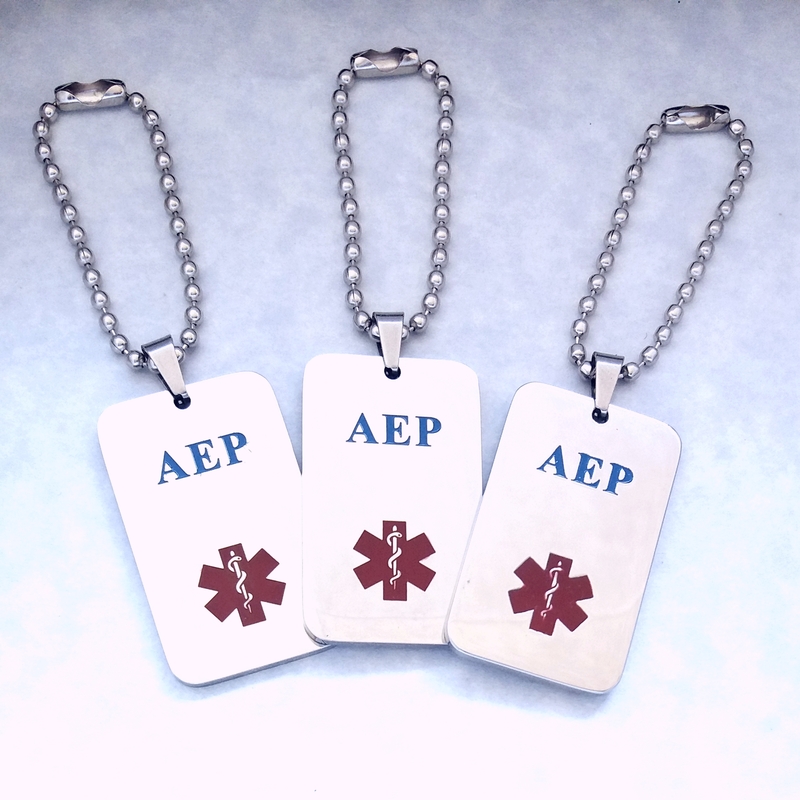 This metal AEP Energy Tag can be used with the Master Restoration or Health Plus Patch for faster relief. The Pain-Tens Relief Tag has been programmed with TENS frequencies and biofilm dissolving frequencies. TENS frequencies relieve nerve related pain conditions by sending signals along the energetic pathways, this stimulates the body to produce higher levels of its own “endorphins” which are natural pain killers. Biofilm dissolving frequencies are also an important addition to this AEP Energy Tag. Where there is chronic pain there is usually inflammation which encourages the formation of Biofilm which is a layer of bacteria and other organisms that live together in a jelly like film. This film protects them from antibiotics, ultraviolet light and other “predators” which makes them hard to kill. When we see a person with inflammation and/or a diseased organ, we almost always find the formation of biofilms. We have found that Biofilms can reduce the circulatory delivery system by as much as 85%. Biofilms can form around the red blood vessels and restrict the amount of oxygen, nutrition, and even important hormones to be delivered to the body. This increases the amount of inflammation in the tissues of the body. The Biofilm frequencies in the Pain TENS Energy Tag will certainly help, but in chronic conditions that are resisting healing one month on the Biofilm + TENS Patch may be the answer. These new Medical Energy Tags have been designed and programmed with a new advanced technology! These Energy Tags cab be worn round the neck or on a pant loop the energy will extend about three feet use as needed. The metal Energy Tags and Patches work well together and both can be used at the same time, but we still do not advise using more than three different types of therapy at the same time. It is better to prioritize. It is preferable to use one Tag at a time, but you can alternate different Tags throughout the day or at night, you can even place it under your bed pillow! The Energy Tags can hold many more specific frequencies than the Patches and the energy will extend about three feet, so the energy it contains may be shared with others. As the body will only take in what it needs anyone close to the Tag may benefit if their body resonates with, and needs the frequency it contains, if not their body will ignore it! Sheila’s Tips: We live in a very stressful world and this and this Medical Energy Tag is great to keep on hand for those times when we feel overwhelmed with worry and anxiety. Just use as and when needed! The Patches are complementary to the Tags so both can be used at the same time. You will see quicker results if you concentrate on no more than three different types of THERAPY at the one time; it is better to prioritize. It is preferable to use one Energy Tag at a time depending on the therapy, but you can alternate different Tags throughout the day or at night. The metal Energy Tags can hold many more specific frequencies than the Patches. The energy radiates out about three feet and may be may be shared with others. The body will only take in what it needs so anyone close to the Tag may benefit if their body resonates with, and needs the frequency it contains, if not their body will ignore it! The metal Tags cannot be corrupted and will hold the programmed energy forever. The Tags may be attached to inner or outer clothing worn around the neck, placed in a pocket, or attached to belt loops. They can be placed on a nearby desk or side table, and placed under a bed pillow at night. Contains all of the Weight Loss Support Patches in one Energy Tag! The Energy Tags have been designed and programmed with a new advanced technology! They do not need to be close to the body as the energy will extend about three feet. The metal Energy Tag does not get corrupted by cell phones or other electronic equipment and the energy will last forever. This Energy Tag is intended to be an Aid to a Diet Plan and Weight Loss Program. It Reduces Appetite, Bloating, and Encourages Physical Activities. It Detoxifies the Organs. It Contains Five Different Fat Burners and Increases Healthy Lymphatic Function to Remove Fat. Ubiquinol * Love of Self * Inner Peace, and more. You will see quicker results if you concentrate on no more than three different types of therapy at the same time, it is better to prioritize. We aim to do a multi-faceted approach to weight management. If you really want to lose weight you need to reduce caloric input and increase physical activity. Every successful weight loss program involves that. This Energy Tag will help you to reach your ideal weight, stay healthy and maintain that weight. The Energy Tags can be worn around the neck or attached to belt loops. They can be placed under food for a few seconds and under your pillow at night to transfer the energy. It is preferable to not use more than one Energy Tag at a time but you can alternate them throughout the day. The Energy Tags can hold many more specific frequencies than the Patches, and the energy will reach 2/3 feet so the energy it contains may be shared with others. The body will only take in what it needs so anyone close to the Tag energy may benefit if their body resonates with, and needs the frequency it contains, if not their body will ignore it! The Energy Tag may be attached to inner or outer clothing worn around the neck, placed in a pocket or attached to belt loops. They can also be placed under food, under a pillow or even attached to your favorite chair, it just needs to be within three feet of the body!